THE FOLLOWING CAN BE DANGERIOUS AND DEADLY and should only be done by people experienced with handling high voltage electricity! Do this at your own risk! I got one of those "powerline sniffers" for troubleshooting Xmas lights, Home Depot (major hardware store) should have similar devices for detecting the presence of powerline voltage on wires. Assuming the cap in question is rated for at least 200VDC (assuming you have 120V powerlines! ), connect temporarily, but carefully!, across the powerline. Use a long barrier strip and connect the powerline to a pair of terminals at one end, and you can grab the other end reasonably safely. Then plug it in. 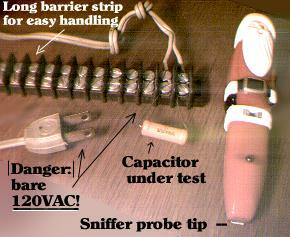 Use the sniffer on the leads to see which is the hot side, and sniff the body to see if you still get a hot indication. Reverse the cap leads (or reverse the power cord's plug), sniff again. The connection that gave a "hotter" indication on the body has the outside foil connected to the lead going to the hot side of the powerline. If you get an ambiguous result, the cap may have foils from both leads exposed inside the insulated body.